Hardscapes - Bellaire Landscape Inc.
Hardscapes, such as rocks and boulders, shape the face of the Earth and also help bring life to gardens by enhancing the beauty of the living elements that surround them. The organic essences of waterfalls and ponds are accentuated by hardscapes like delicately layered stones and colourful rocks. Interlocking brick pavers, decorative stamped concrete and natural stone steps can all be used to entice visitors to enjoy the natural splendor of your newly landscaped gardens brimming with blooming flowers and plants. A refreshing pool and outdoor patio provides years of pleasure! Stamped or regular concrete patios increase your living space to the outdoors. They provide additional seating areas to gather with friends and family. 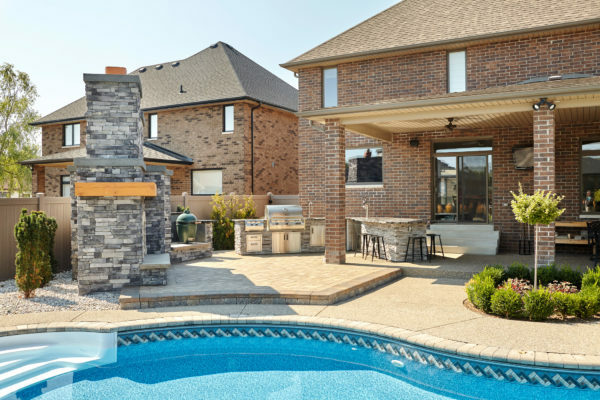 Envision yourself and loved ones enjoying the fresh summer breezes and smells of food grilling on the barbeque while relaxing comfortably on your newly landscaped patio. From an old English dry lay flagstone patio with moss or thyme growing between the stones to a raised tumbled interlock stone patio with benches and walls built from stone. Our landscape designers are a highly skilled and experienced team of landscape professionals that consistently create hardscape masterpieces; whether it is in the form of a garden wall, patio, walkway, driveway, staircase, water feature or just large garden boulders. Bellaire Landscape can design a landscaped paradise for you in your front or back yard that will convey a sense of permanence and distinction. Rico Rock Makes Pools & Ponds Come Alive! Perhaps you are looking for the latest state-of-the-art swimming pool design. Imagine yourself swimming in a cascading waterfall layered with beautiful landscaped artificial rock at your pool’s edge. Rico Rock waterfalls add style and elegance to every swimming pool or pond. 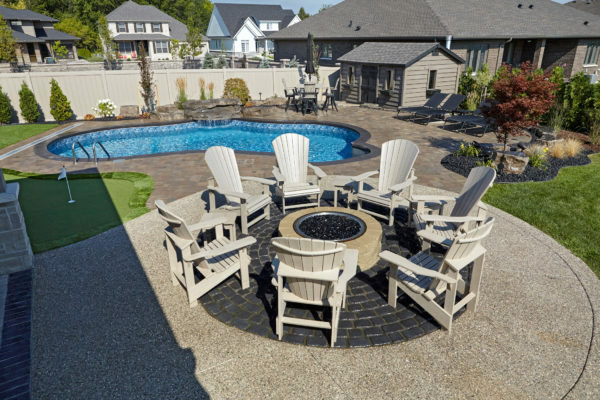 Rock Formations Inc. established many of the methods and styles used today to bring artificial rock into the swimming pool industry. The use of natural rock is difficult when constructing pools and artificial rock proved to be a better choice structurally. Rock waterfall landscaping designs can range from several inches to numerous feet in length depending on your preferred design, available space and financial budget. Rico Rock is a patent pending system of waterfall construction that features a waterproof shell, steel reinforced concrete construction and cast rock pieces. The components are manufactured by Rico Rock for quality control and are mortared in place for a permanent installation, designed to last the lifetime of your pool. In addition, waterslides, caves and entire swimming pools of artificial rock prove to be very popular. They are a great way to enhance any yard and make it more appealing. The Rico Rock system is reasonably priced and structurally sound.